G4 analysis: What does the future hold for the Euro? The Euro has remained resilient since the beginning of the year. It rallied to its strongest position against the US Dollar in eight months in May, even in the face of large scale easing measures announced by the European Central Bank (ECB) in March. However, the hawkish turn taken by Federal Reserve communications have pushed the Euro down in the second half of May towards the bottom of the recent ranges. There were no major surprises from the ECB at the Governing Council’s April meeting, with policymakers opting to keep monetary policy unchanged. The main refinancing and deposit rates were held at 0% and -0.4% respectively, while the central bank will continue to purchase 80 billion Euros a month in asset purchases. Governor of the ECB Mario Draghi warned that inflation could turn negative in the coming months, with risks from abroad tilted ‘to the downside’. However, policymakers opted to wait for evidence that March’s additional stimulus measures have provided a boost to both growth and inflation before committing further. Mario Draghi’s so-called ‘bazooka’ of stimulus measures still appears to have had little effect on price growth in the Euro-area. 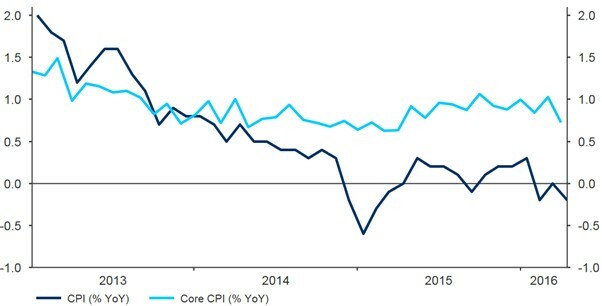 Headline inflation declined by 0.2% in the year to April (Figure 1), its largest decline since the launch of the ECB’s quantitative easing programme in March 2015. The core measure also fell alarmingly to just 0.7%. We think that the ECB still has the capability to introduce additional easing measures if inflation in the Eurozone fails to show meaningful improvement in the coming months or economic growth flags. In addition to inflation, we are paying particular attention to the leading PMI composite business confidence indicator (Figure 2). If this index started trending down from current levels, we think new stimulus measures will be in the cards as early as the ECB’s September meeting. Growth in the economy also remains weak, despite rebounding in the first three months of the year to a still very modest 0.5% for the quarter. 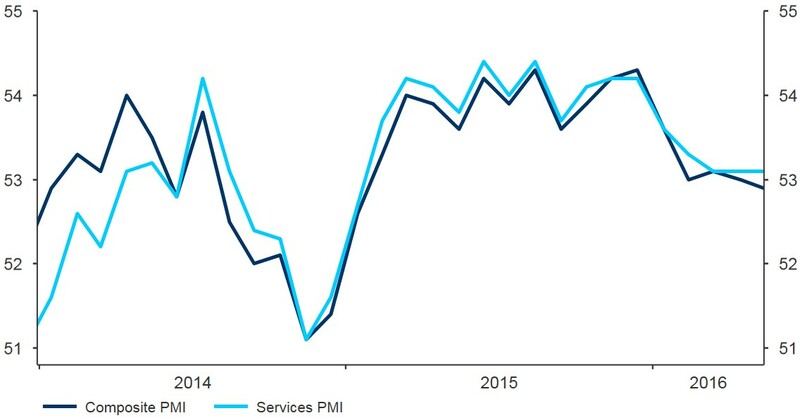 Industrial production has declined, while the services PMI has plunged to its weakest level in well over a year. What does the future hold for EUR? With additional easing measures from the ECB still possible, we continue to expect the Euro to recommence its downward path against the US Dollar. This will be enhanced once the Federal Reserve moves to hike US interest rates. This should lead to a similar depreciation of the single currency against Sterling. Get in touch to discuss your Euro exposure.